There are just two weeks to go in the Kickstarter for A Robot, a Cyborg, and a Martian Walk into a Space Bar, and although the Kickstarter got off to a great start, it has slowed quite a bit since. This is going to be a really fun read, and we really need your help in getting it off the ground...so anything you can contribute would be appreciated. I haven't posted much of late because, as always, I've been crazy busy. I'm still working the "real" job while I try to continue to get stuff done at home...not always easy. Plus, the holidays are crazy time with three kids, so I don't always do everything I'd want to do, and most of the time, the first thing to suffer is blogging. 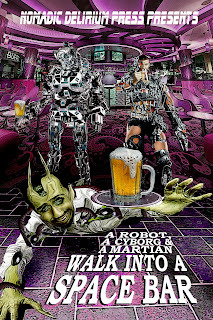 Much of my time has been dedicated to promoting the Kickstarter for A Robot, a Cyborg, and a Martian Walk into a Space Bar. With a name like that, you know it has to be worth picking up, and if you want to help the Kickstarter (which would be greatly appreciated), you can at https://www.kickstarter.com/projects/1521750492/a-robot-a-cyborg-and-a-martian-walk-into-a-space-b. I've also been working on putting together the anthology, which means a lot of editing and formatting...tedious, but fun work. I'm also getting the December issue of The Fifth Di... ready. And I wouldn't be me if I wasn't annoying people by promoting my two most recent releases, Taurin Tales as an editor and Where the Fleet of Stars is Anchored as a writer. Not to be forgotten, I have been doing some work on the next installment of The Ephemeris Encyclopedia Galactica, although not as much work as I might like. Finally, I've actually been doing some writing. I've started working on a story that I should have written a long time ago, and this became very obvious to me with the recent passing of a writer friend. I don't want to say much about the story right now, but I will blog about it as it progresses. We've officially launched the Kickstarter for A Robot, a Cyborg, and a Martian Walk into a Space Bar. It can be found at: https://www.kickstarter.com/projects/1521750492/a-robot-a-cyborg-and-a-martian-walk-into-a-space-b, and any support you can offer is greatly appreciated. 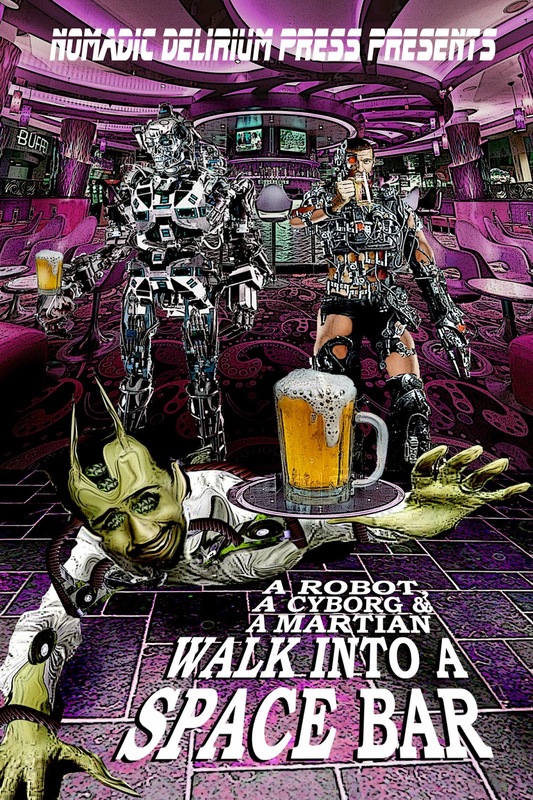 Here is the awesome cover for A Robot, a Cyborg, and a Martian Walk into a Space Bar. The book will be released on Jan. 15th, and we will be launching a Kickstarter very soon for this project, so keep your eyes on this page. It's hard to believe that four years ago today Alexis came into our lives. In those four years we've watched her grow and change so much. She's now a young lady with so much personality, and we all love her so much. Every day we are so proud of the things she does, and we can't wait to see who she grows up to be. She will be having a Teenage Mutant Ninja Turtles party in a little while, and she is so excited. These are not in the order that they will appear in the anthology, but here are the stories that will be appearing in A Robot, a Cyborg, and a Martian Walk into a Space Bar, which is due to be released on January 15th, 2015. Nomadic Delirium Press is having an e-book sale that lasts until the day before Thanksgiving. Many of their titles are listed for 10-50% off, and this includes a number of titles that I either wrote or edited. For example, you can get Taurin Tales for 30% off at http://nomadicdeliriumpress.com/blog/product/taurin-tales/, or The Martian Wave: 2014 for 10% off at http://nomadicdeliriumpress.com/blog/product/the-martian-wave-2014/, or The Ephemeris Omnibus 2013 for almost 50% off at http://nomadicdeliriumpress.com/blog/product/the-ephemeris-omnibus-2013/, or Seedlings on the Solar Winds, and other stories for almost 50% off at http://nomadicdeliriumpress.com/blog/product/seedlings-on-the-solar-winds/.